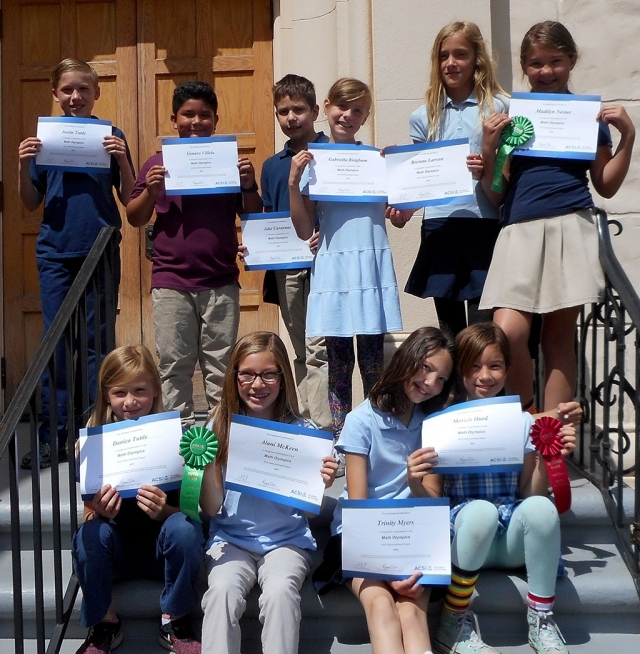 On Friday, April 20, ten students from Fillmore Christian Academy competed in the ACSI District 6 Math Olympics held in West Hills. 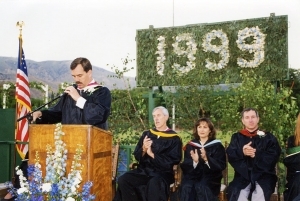 Students from all over Santa Barbara, Ventura and Los Angeles Counties in grades third through eighth competed in one of two categories – Reasoning or Computation. All of FCA’s students did an outstanding job! Three of FCA’s students came home with ribbons for their grade and category: Moriah Hurd placed second in 3rd Grade Reasoning, Alani McKeen placed 5th in 3rd Grade Computation, and Madilyn Nester placed 5th in 4th Grade Reasoning. Pictured above are the students who participated: back row (l-r) Justin Tuttle, Genaro Villela, Jacob Cardenas, Gabriella Bingham, Brenna Larson and Madilyn Nester. Front row (l-r) Danica Tuttle, Alani McKeen, Trinity Myers, and Moriah Hurd. Courtesy Tracy Hackney. 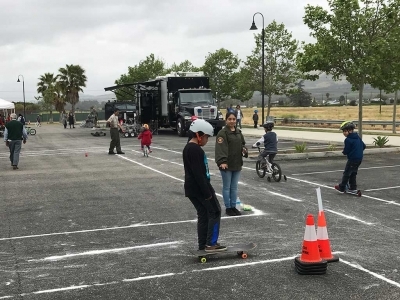 Saturday, May 12th from 9am to 12pm at Two River’s Park the Fillmore Citizen Patrol, Police Department and the Santa Clara Valley Explorer Post hosted their Annual Bike and Skateboard Safety Rodeo. Kids were able to get free helmets and fitting assistants, participant in a safety course, as well as meet some of the local law enforcement personnel. Photos courtesy of Fillmore Citizen Patrol. 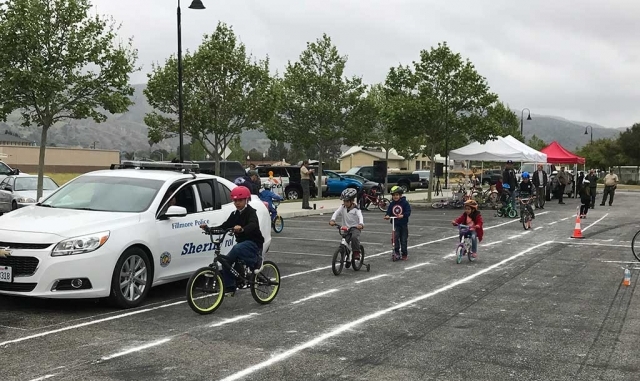 On Saturday, May 12th the Fillmore Citizen Patrol, in partnership with the Fillmore Police Department and the Santa Clara Valley Explorer Post, hosted a public Bicycle and Skateboard Safety Event. 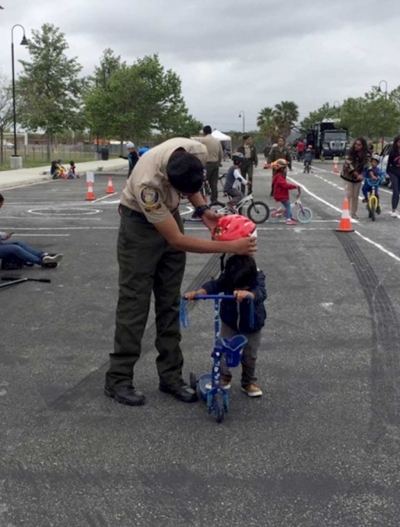 The Bike Rodeo was held at the Two Rivers Park and included a safety course, free helmets and fitting assistance, bicycle registration, bicycle tune-ups, raffle prizes and food vendors. It featured displays from the Ventura County Sheriff’s Bomb Squad, SWAT Unit, K9 Unit, Search and Rescue Unit and the Fillmore Fire Department. The Fillmore Citizen Patrol would like to extend a special thank you to the following sponsors of our event: Rotary Club of Fillmore, Lion’s Club of Fillmore, Fillmore Fire Foundation, TNT, Search and Rescue, Ventura County Deputy Sheriff’s Association, Bike Ventura, Baskin Robbins and Kona Ice. After two separate injury accidents at the end of April involving a vehicle striking a juvenile who was riding a bicycle without a helmet, events like this are vital to the safety of children in our community. During the upcoming summer months, the Fillmore Police Department, Fillmore Citizen Patrol and Fillmore Fire Department will be looking for children wearing helmets while riding bicycles, skateboards, and scooters in the community. Each child found to be wearing a helmet will receive one Baskin Robbins certificate for a free ice cream cone. 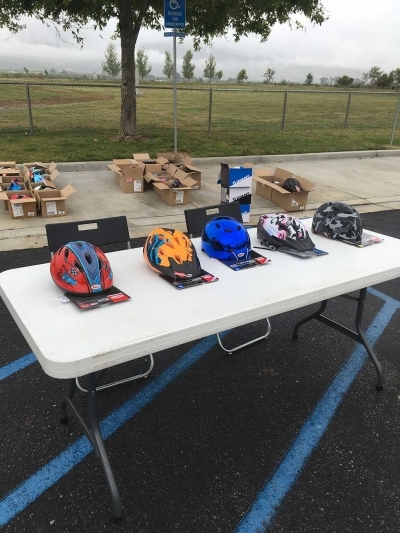 For those children who are found without helmets, they will receive certificates for a free helmet that can be picked up at the Fillmore Police Station during office hours, 8 AM to 5 PM, Monday - Friday. 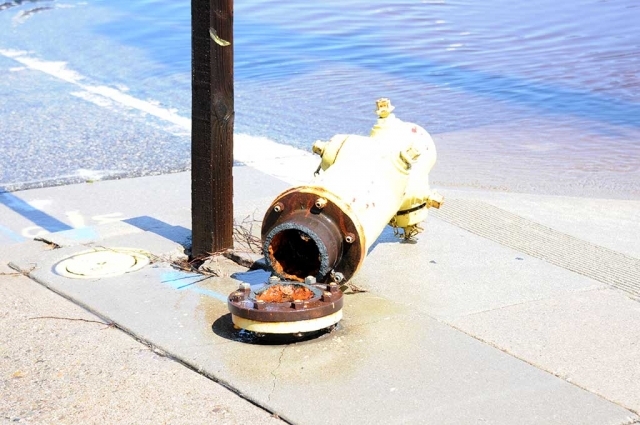 On Wednesday, May 9th at 2:13pm on the corner of Ventura and Fillmore Street crews responded to calls about a fire hydrant that had been hit by a vehicle and water flooding the street. City workers responded and quickly turned the water off. 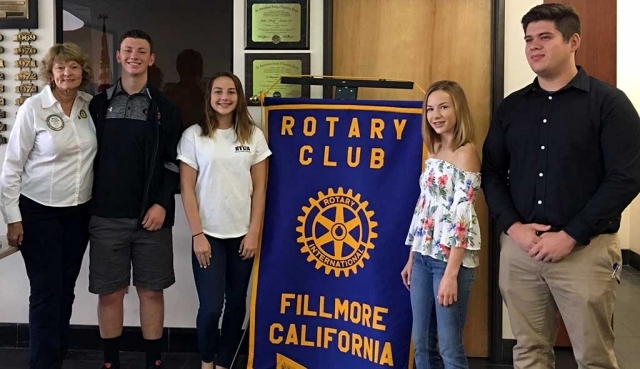 Pictured (l-r) are Martha Richardson-Rotary Youth Leadership Awards Chair (RYLA), Remy Richardson, who attends Grace Brethren, Natalie Couse, Katie Johnson, and Damian Mesa. Fillmore Rotary sponsored the Fillmore High School students to attend the RYLA camp in Ojai. After camp was completed the students visited Rotary Club and shared their experiences, what leadership skills they had learned and their plans for the future. Public works agencies play a vital role in assisting communities to prepare, respond and recover from disasters. The work of public works professionals is often done behind-the-scenes but serves to protect and enhance the safety, health and quality of life of our community. To bring to light the important role Ventura County Public Works Agency (VCPWA) plays within Ventura County and to educate the public on the wide variety of services provided, VCPWA will be hosting its National Public Works Day. 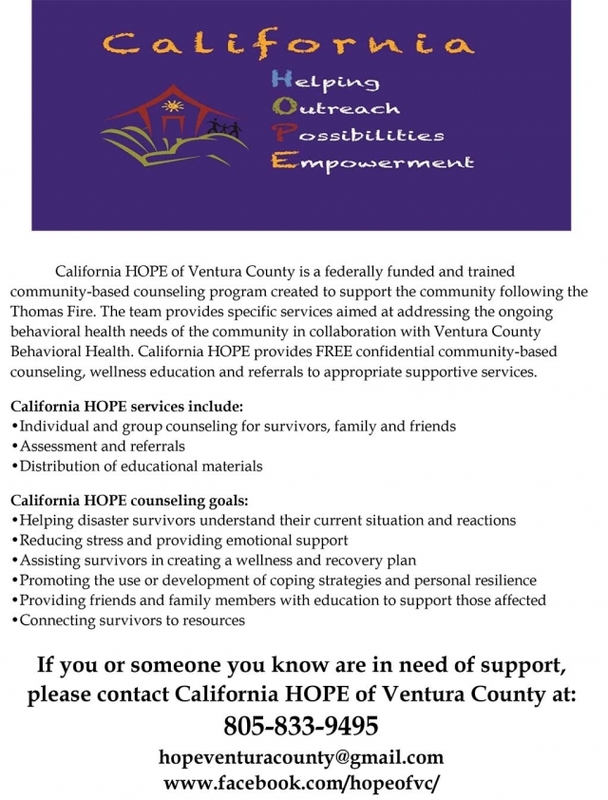 This one-day, free community event will be held on Tuesday, May 22, from 9 a.m. until 2 p.m. at the Ventura County Government Center. This year’s event will focus on emergency preparedness and response activities to events such as the Thomas Fire and winter storms. Attendees will have the opportunity to visit a wide range of hands-on booths, all highlighting the diverse scope of work for VCPWA’s five departments. Tours will feature information on native and drought tolerant plants, surveying, traffic signal technology, composting with worms, its award-winning raptor program, and demonstrations of the latest technology employed by the agency. 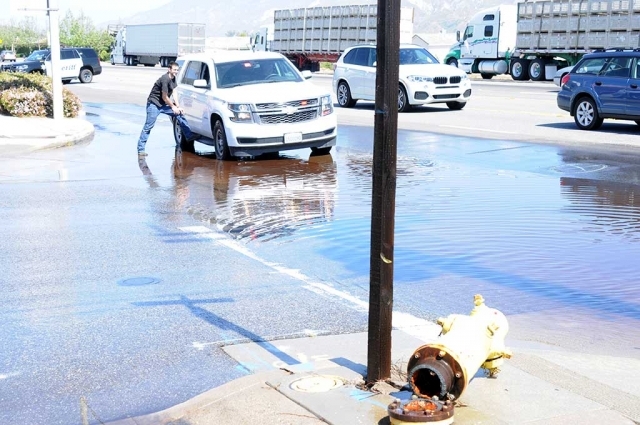 Along with the county’s activities, the City of Ventura’s public works team will be on-site to host two booths as well as a demonstration of the city’s pothole filler equipment. •	An updated and enhanced Career Center – VCPWA and County HR teams will be on hand to share information about current career opportunities and the student worker program. VCPWA engineers and field staff will be on site sharing the many ways a STEM (science, technology, engineering and mathematics) education could lead to career opportunities in public works. The cities of Oxnard and Ventura will also be joining the Career Center with information about their employment opportunities. Representatives from the American Society of Civil Engineers will be on site with career information. •	Watershed Protection District - GIS/Technology: Will be showing how modern “Geographic Information System” technology has improved map making over time, how data is used to build digital maps and how it’s shared in the GIS community of County departments. Information in GIS maps can depict many features such as parcels, roads, streams, points of interest and much more. It can be assembled from records, gathered in real time, or even remotely acquired from remote weather stations (to derive current rainfall) or airborne (LiDAR to derive topography). The maps can also be viewed on the internet and cell phones. •	Ventura County Sheriff’s Office of Emergency Services (OES) and VCPWA’s Storm Tracking Center will partner to create a simulation Emergency Operations Center where students will be given emergency scenarios to work out! They will also be taught the importance of a “go kit” and what to pack in case of an emergency. •	Bicycle and Pedestrian Facilities: Learn about the work the Transportation Department conducts on county roads for motorists, bicyclists and pedestrians that makes our community safer. •	Traffic Detection Display and Demonstration: Displaying the latest technology utilized in detecting vehicle traffic in order for traffic signals to respond appropriately according to traffic flow. They will demonstrate how the technology can distinguish between vehicle, pedestrian and vehicle traffic to improve safety. •	General Services Agency (GSA): Fleet Services staff will demonstrate how a Chevrolet Tahoe is transformed from an ordinary SUV to a Sheriff pursuit vehicle. •	Manhole Covers: Learn how VCPWA workers safely enter and exit a manhole using a tri-pod wench. VCPWA’s NPWW event has grown tremendously since launching in 2012. In 2017, more than 700 were students out of the 1,000 attendees in attendance. VCPWA anticipates a similar turnout of youth, parents and teachers to participate at this year’s education event. To encourage an increase in bicycle safety in our community, the Fillmore Citizen Patrol will be holding a bicycle and skateboard safety rodeo from 9 AM to 12 PM on Saturday, May 12th. The event will be near the BMX track at Two Rivers Park and will feature a safety course, free helmets and fitting assistance, bicycle registration, raffle prizes, and food vendors. The event will also feature displays from the Sheriff’s Bomb Squad, SWAT team, K9 Unit and Fillmore Fire Department. On April 20th, 2018 and on April 25th, 2018, the Fillmore Police Department responded to two separate injury accidents involving a vehicle striking a juvenile who was riding a bicycle without a helmet. Both juveniles suffered non-life threatening injuries as a result of the collisions. The cause of the accidents is still under investigation, but alcohol or drugs were not a factor. The Fillmore Police Department encourages all riders, regardless of age, to take advantage of modern safety equipment, and for parents to ensure their children are wearing helmets while riding bicycles and skateboards. The safety of our children is a top priority in the city of Fillmore, and we encourage parents to attend this event with their children. 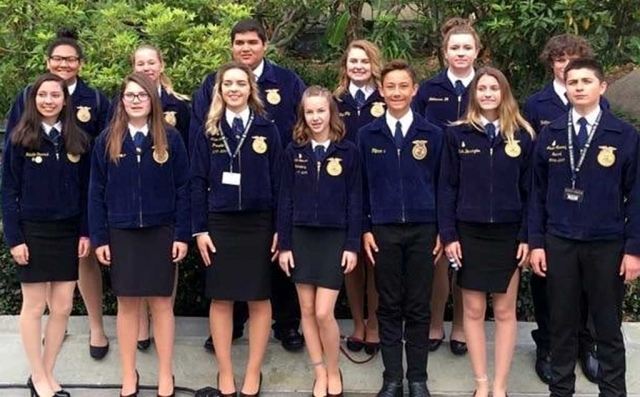 Fillmore High School FFA Club attended the State Future Farmers of America Convention held in Anaheim this year. The convention began April 23rd and lasted four days where student attended leadership and competition classes and much more. The State convention also selected various schools to go to Disneyland as part of their experience and Fillmore High was one of the lucky schools that were able to go. 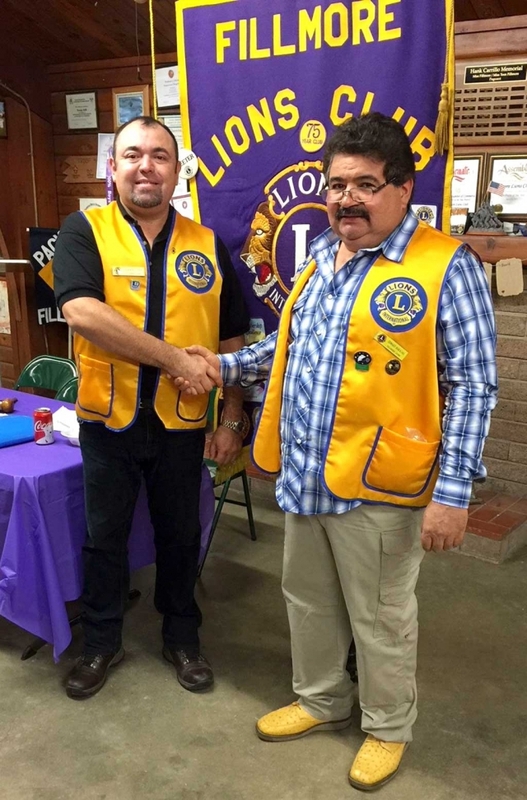 The Fillmore Lions Club has added a new member with the induction of German Cea. Fillmore Club President Eddie Barajas (right) congratulates Cea during induction ceremonies at a recent meeting. In addition to his name tag Cea was also presented with a Lions’ vest. Photo courtesy Brain Wilson. 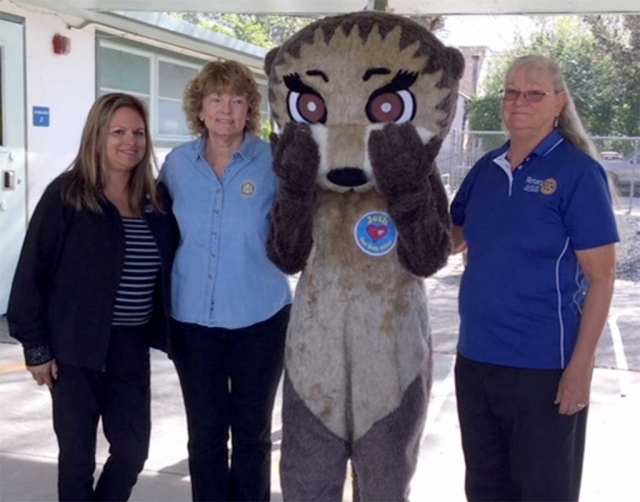 This past week Fillmore Rotary Club and Josh the Otter visited local Preschools to teach students about water safety. Pictured (l-r) Ari Larson, Martha Richardson, Josh, Cindy Blatt. Photo courtesy Martha Richardson. 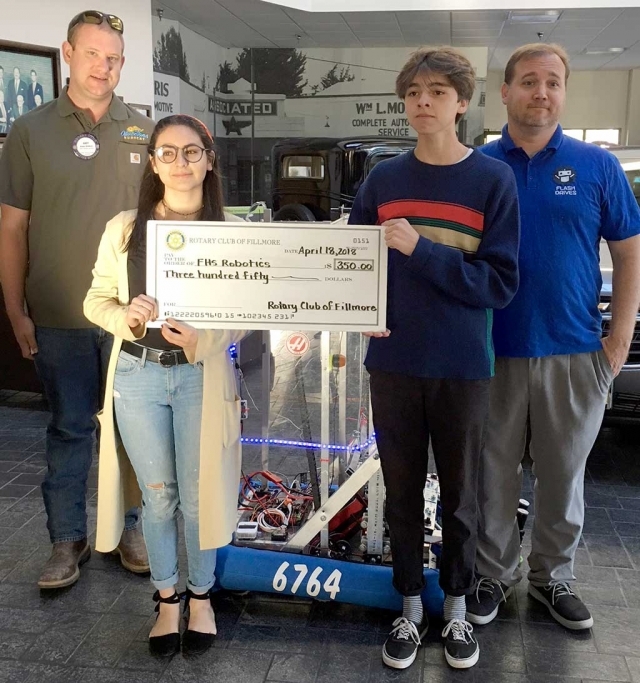 Rotary President Elect, Andy Klittich on the far left presented a check for $350 to the Fillmore High School Robotics Team. Two of the Robotics Team members, Paulina Guerrero and Andres Romero, holding the check, demonstrated the robot the team built. Their teacher, Mr. McMahon on the far right explained to the club about competitions they have participated in this past year. Photo courtesy Martha Richardson. 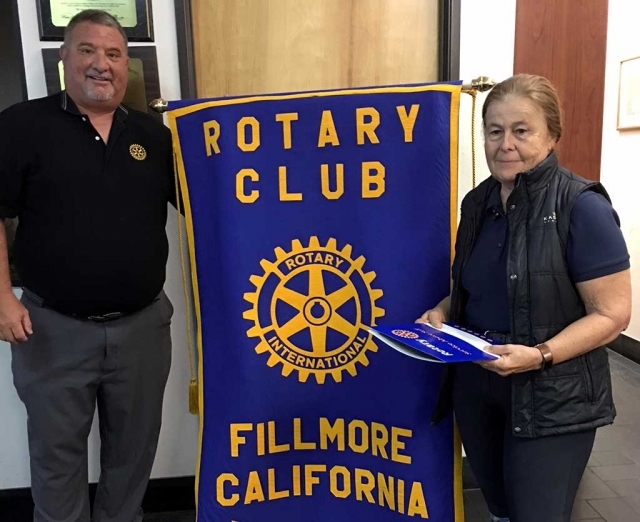 Fillmore Rotary Club President Dave Wareham initiated the newest Rotarian, Barbara Filkins. Photo Courtesy Martha Richardson. The City of Fillmore advises all local non-profit organizations that applications are available Tuesday, April 11th, for 2018 firework booth permits. Applications will be accepted until 4 p.m. on Thursday, May 31st in the City Clerk's office at Fillmore City Hall, 250 Central Avenue. The fee is $400.00; all organizations must provide proof of non-profit status and complete a “no fee” business license application. The City’s Municipal Code (Section 15.38.030) requires applicants to be a non-profit association or corporation organized primarily for veteran, patriotic, welfare, city betterment, religious or charitable purposes, having on file with the City of Fillmore proof of non-profit status from either the IRS, California Secretary of State or the State Attorney General, having its principal and permanent meeting place in the City, and having been organized and established in the City for a minimum of three years continuously preceding the filing of the permit application. A maximum of 25 permits will be issued, and priority will be given to organizations that were issued permits in 2017 and continue to be eligible. If necessary, a lottery will be held in early June to randomly determine which organizations will receive permits in addition to the qualified organizations. Fireworks sales may occur within the City limits from Wednesday, June 28th at twelve o’clock noon through Wednesday, July 5th at twelve o’clock noon. IT IS VERY IMPORTANT THAT YOU COMPLETE THE 2018 APPLICATION – THE CITY WILL NOT ACCEPT APPLICATIONS FROM PREVIOUS YEARS. Clerk’s Office at Fillmore City Hall between the hours of 8:00 a.m. and 4:00p.m., Monday through Thursday and alternate Fridays, or by calling 524-1500, extension 234 or emailing jlatshaw@ci.fillmore.ca.us. 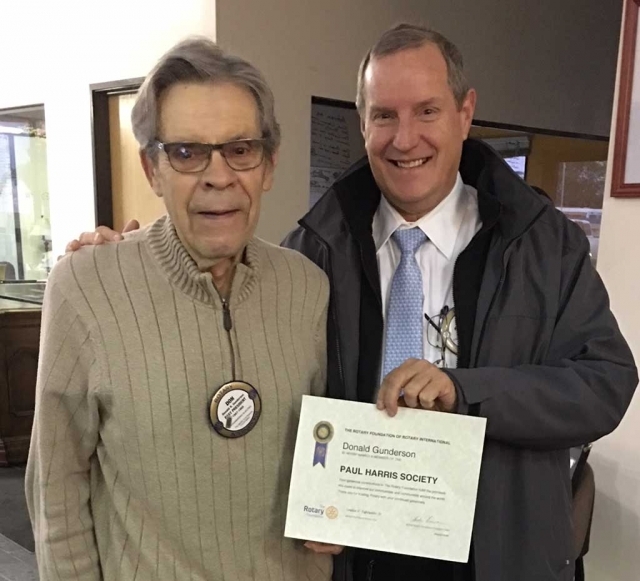 Rotarian Don Gunderson, was recognized by Kyle Wilson as a Paul Harris Society Member. Rotarians can donate to the Rotary Foundation which supports projects internationally and locally. By donating members can become a Paul Harris Fellow, Paul Harris Society Member, or Paul Harris Major Donor. No only was Don being recognized he also celebrated his birthday. Photo courtesy Martha Richardson. 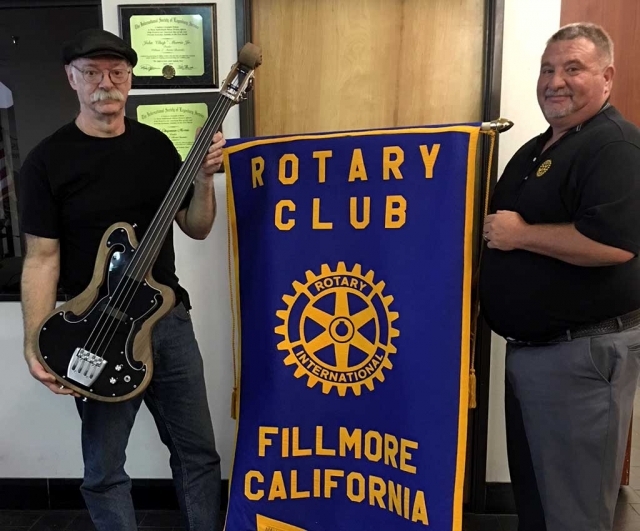 Bruce Johnson standing with Dave Wareham, is our local Luthier presented the latest program to the Rotary club. He has a craftsman shop where he crafts specialty guitars, in the old school way and sells them on his website. He is promoting a Jam Fest every Sunday, near the train station, beginning April 22. It will be a time when locals can join in or just come to listen. Photo courtesy Martha Richardson. The Friends of the Fillmore Library are hosting a fundraising luncheon to raise funds for the Fillmore Library Expansion Project. The luncheon will be held on May 21, 2018 at 1 pm at the El Pescador Restaurant, 1305 W. Ventura St, Fillmore. Tickets are $20 apiece or $30 for two. For those who wish to purchase tickets but cannot attend the luncheon, special arrangements will be made by the Friends to deliver lunches. To purchase tickets please contact the Friends of the Fillmore Library at 805-524-2731. Community members may also purchase tickets for the luncheon and find out more about the library expansion project in person at the next Fillmore Library Expansion Project Committee Meeting to be held at the Fillmore Library, 502 Second St., Fillmore on April 18, 2018 at 7pm. This meeting is open to all community members to discuss the project to expand and enhance the Fillmore Library. This meeting is free and open to the public; anyone interested in discovering more about this project or learning how the community can help is encouraged to attend. Library Expansion Project partners include: the City of Fillmore, Ventura County Library Foundation, and Friends of the Fillmore Library. For additional information, contact Ventura County Library Director, Nancy Schram at nancy.schram@ventura.org or (805) 256-8535. Fillmore Library is located at 502 Second St., Fillmore, CA 93015. Hours of service are Mondays and Tuesdays 2pm – 7pm; Wednesdays 10am – 5pm; Thursdays through Saturdays 12pm – 5pm. Inspiring our community to explore, discover, and connect. The Ventura County Library is available 24/7 at www.vencolibrary.org. Saturday, April 21, 2018, 10:00 a.m. – 1:00 p.m.
*Power point presentation on citrus history and citrus labels at 11:00 a.m.
*Citrus goodies will be served. The Citrus Label Society was founded in 1981 with the purpose of providing meeting places for citrus label collectors to gather together and exchange labels, to enjoy special citrus-related programs, and to share and preserve historical information about the citrus industry. 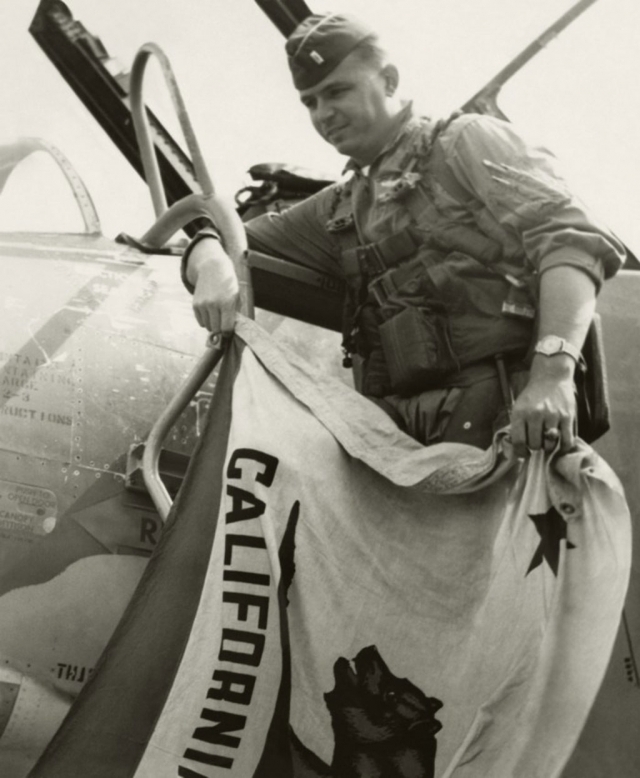 Citrus labels are unique, visual images that document California’s citrus heritage and the state’s history, and are also appreciated by collectors as beautiful works of art. Everyone is welcome to this special Ventura County meeting. Tell the docent at the entrance that you are attending the meeting, and there will be no charge for Museum admission. You will also be free to enjoy the interesting historical exhibits in the Museum. The Fillmore Flower show is almost here! The theme this year is “Fillmore Blooms!” Look around your garden and select the blooms you want to enter. We have many faithful gardeners who bring flowers, potted plants, arrangements, bouquets and dish gardens every year. That is what keeps the flower show going. But, we encourage others to participate too. Maybe you are telling yourself, “I can’t compete with those people. I just have a few blossoms.” Well, one of those blossoms might be the grand prize winner. Or maybe you will just get a ribbon, but meet some wonderful people who also love gardening. You may hear people complimenting your bloom. 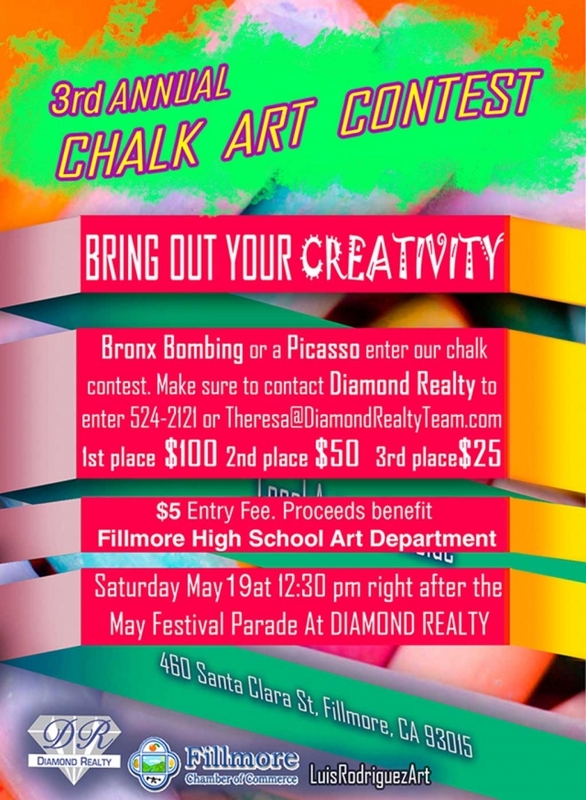 Whatever the outcome, you will hear lovely music, see amazing displays, eat some cookies, read youth compositions and celebrate being in Fillmore. Bring your entries to the Active Adult Center, 533 Santa Clara Street, between 7:30 and 10:00 a.m. on Saturday morning (April 14). $5 entry fee no matter how many entries. Youth compositions should be dropped off at the same location Friday afternoon between 3:00 and 4:30 p.m. Youth arrangements are created at the center by the entrant between 7:30 and 10:00 a.m. Saturday. Remember, there is a category for youth team entries. Youth entries are free. Please set aside some time next weekend to come to the Fillmore Flower Show. Public viewing is 1:00 to 4:00 Saturday and Sunday. Free admission.